The elite men’s race at Sunday’s Virgin Money London Marathon has been billed as a ‘clash of the champions’ as defending champion Wilson Kipsang takes on the man who last year broke his world marathon record, Dennis Kimetto. But the duo, who are training partners in the Kenyan town of Iten but have never faced each other over the marathon distance, are just two members of a stacked line-up which also includes another six men who have gone sub-2:05. That list includes 2011 London winner Emmanuel Mutai, who ran the second fastest time ever when finishing behind Kimetto and his 2:02:57 in Berlin last year, and his namesake Geoffrey Mutai, the former Boston, New York and Berlin Marathon champion who won the World Marathon Majors series in 2012. Last year’s London runner-up, 2:04:55 man Stanley Biwott, returns looking to go one better, while 2003 world 5000m champion and last year’s Chicago Marathon winner Eliud Kipchoge, who has run 2:04:05, makes his London Marathon debut. 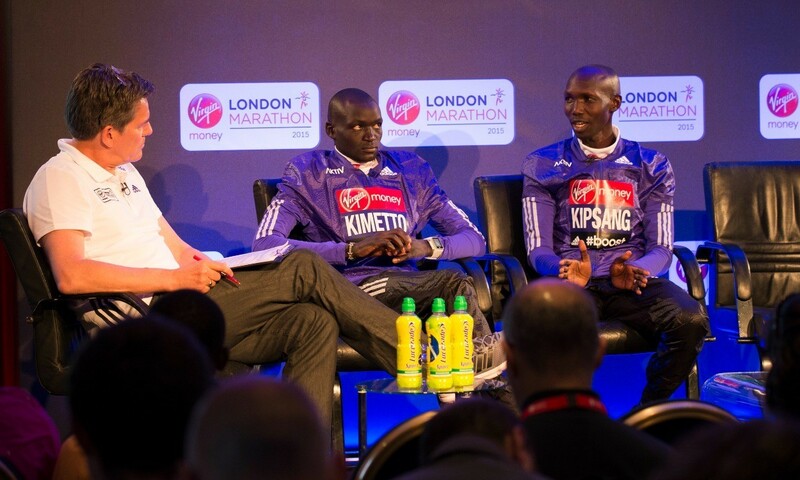 Discussing his aims for this weekend in front of media on Thursday, Kipsang, who broke the London course record with his 2:04:29 last year, said: “I think my main aim on Sunday is not really the world record but retaining the title and running a good time. On the test of going up against Kimetto, Kipsang added: “I am expecting a very big challenge (from Kimetto). The pair have a 1-1 record when it comes to going head-to-head over the half-marathon distance. Kimetto won the RAK Half Marathon in 2012 when contesting his first international race as Kipsang finished third, while Kipsang finished second ahead of Kimetto last year in Olomouc, Czech Republic, as both were beaten by pacemaker Geoffrey Ronoh.